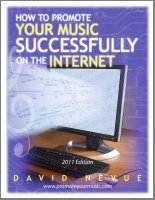 As most of you know, I'm the author of the book How to Promote Your Music Successfully on the Internet. I've been marketing my own music online for what, 13 years now (since 1995)? One of the aspects of Internet marketing I'm working on for the next edition of my book (the 2009 Edition) is the impact of social media on marketing music. Now, every year there is inevitably a "buzz" about the this or that - some big new something that is the rage in online marketing. Well, right now it's social media. And so one of the things I have been exploring is the viability of using social media to promote ones music. And one of the tools I have just started using is Twitter. Now, for those of you who don't know, Twitter is, essentially, a micro-blog. You have just 140 characters to type in what you're doing right now, your comments, capsule reviews, link recommendations and so on. People who like you and who are interested in you (say fans, friends, your mother-in-law) can "follow" you and watch your every move, your ever public thought, and whatever else you want to put out into the micro-blogosphere. Is Twitter good? Is it bad? I don't know, but it's kind of fun. And it's a bit addicting for some strange reason. Can addictions be good? Another tool that I use regularly is Google Alerts. I use this to monitor certain keywords., and Google notifies me whenever the search engine indexes a keyword or phrase that I'm monitoring. Of course, one of the keywords I'm watching is my name, David Nevue, because I want to see who's talking about me and what they are saying. Usually, this is a good thing. Sometimes it's not. Do you really want to know what people say about you when they think you aren't listening? :) I'm always listening. What can I say, I'm a control freak. It's part of why I'm successful (because of my dogged do-it-myself determination) and also, unfortunately, why I can't sleep at night. At any rate, I am notified by Google Alert whenever anyone posts any page anywhere that includes my name and Google indexes it. It could be a blog mention, a CD review of my music, a playlist, or someone giving away my MP3s illegally. If it gets into Google, I know about it. I mention this because of a pleasant surprise I discovered with Twitter this morning. Now, I've only been on Twitter for a week or so. I probably should have been involved with Twitter sooner, but the reality is, there are a zillion things going on out there on the net and I can only investigate so many and still keep my business running (plus I am first and foremost, a musician - there is this thing called practice and performing I have to do!) So I only want to spend my time on the marketing opportunities that are here to stay for awhile. Well, Twitter has, in my opinion, become one of the biggest successes of the new "Web 2.0" social networking experience. It has become so successful, in fact, that it's actually had a number of technical problems keeping up with it's popularity. Remember how unreliable MySpace was in it's first couple of years? Well, MySpace has gotten a lot better, hasn't it? Well, Twitter is going through those same growing pains now. Here's the point of all this (my, I'm taking a long time to make my point! ), I've been on Twitter for just a week now and I've got about two-dozen people following me. Hey, it's a start. Someone Twittered about me yesterday and guess what? Already that Twitter has been indexed by Google. I know this because of my Google Alerts account. Someone mentioned me yesterday and boom, there it is a day later in the Google search engine results for my name. I was shocked at how quickly that happened. Everything you type in Twitter gets indexed (or has the potential of getting indexed) by Google into their search engine results. That makes Twitter a VERY useful marketing tool for those of you who are search-engine aware. If you enter specific keywords into your twitter communications, those Twitters may be found by people searching Google on that particular keyword. So, for those of you using Twitter, be aware of this. When you Twitter anything about your day, be as specific as you can and use keyword-rich content. If you're preparing for a concert gig, for example, when you mention that on Twitter, include the name of the gig venue, so that when someone searches for that Venue name in Google, there is the chance that they'll discover you. There are so many ways you can target Google searches using Twitter, and then draw people to your own Twitter page and then, hopefully, to your music. Just ponder this, and then, as you twitter, consider ways that you can get specific so that your Twitter messages might benefit you on the search engines. This is NOT to say that you should use Twitter as a spam machine (if you do this, no one will bother following you on Twitter), but just that, as you post your daily routine, think of ways you can include specific keyword text that people may be searching on. There are so many things you can twitter about and then relate back to your music. Popular movies you see, celebrities, artists who sound like you, books you read, political events and so on. The key with Twitter is that you have just 140 characters to do it! That can be a challenge. But it's a fun one - sometimes fitting your thoughts into 140 characters feels very much like solving a crossword puzzle. This blog should be the perfect reminder that EVERYTHING you type ANYWHERE online is being archived somewhere, permanently. So for those of you with privacy concerns, this is yet another heads up. Watch what you say. Nothing you do online is truly private. And yes, (hopefully), people are following you. There's a new search engine getting some buzz on the net... Cuil. I've seen a number of stories about it on the net already. Perform a search for yourself on it. It's interesting, but I'll stick with Google. Going Digital: Atoms and Bits or Bits Without Atoms? Just about every artist and label is releasing music in some digital form these days. That's a no-brainer, and I see no reason not to release any new project digitally -- as bits. But many clients are asking themselves if they also need to release in one of the traditional physical formats such as CD or LP -- in other words, as atoms. Such a decision has to be based on the many disparate aspects of a business and will be different in each instance. It all depends on an artist's or label's circumstances. What should YOU do? Read the article, Going Digital: Atoms and Bits or Bits Without Atoms by Keith Holzman to find out more.